Learn how to create a new manual push campaign. In this document we are going to show you how to create a new website push notification campaign. Start off by logging into your Aimtell account and opening your dashboard. This will bring you to a screen asking you to name your campaign. Type in the name you want and select ‘Create Campaign’ at the bottom right of the screen. The next screen has all of your customization options for your campaign. The ‘Content’ tab will be highlighted and is the area where you input the body of your message along with the additional fields you want displayed. The informational fields include: Name, Title, Icon, Image, Body, and Destination URL. Name: This will be the name of your campaign for your own reference, i.e. Summer Sale, West Coast Shoppers. Title: This is the headline of your notification, the first line of text that your subscribers will see. Body: - This is the description of your notification, the main and largest part of your notification which goes into more detail of the headline. Icon: - A square image displayed next to your notification. This will grab your site icon by default but can be customized per push. Image: - An optional rectangular image displayed under your notification. Available on Chrome only. Destination URL: - This is where you would input the website link that your subscribers will be taken to when they click on your notification. When you have input this information, select the ‘Recipients’ tab to determine who will receive this notification. From this tab you will select which segment (or segments) you wish to include. You may want this notification to go to all of your subscribers, or you may choose a particular segment of individuals. If users are part of multiple segments and you send a campaign to all of those segments, they will only receive one notification. Now it is time to set up the schedule on the fifth and final tab. Select the date and time you want your notification campaign to be sent. That’s it! Select ‘Schedule Push’ at the bottom of the page and your campaign will be created and will send at the specified time. Campaigns may be saved as drafts and edited at a later time or marked as scheduled. Please note that scheduled notifications will be locked once the schedule date is reached, as they will begin spooling. 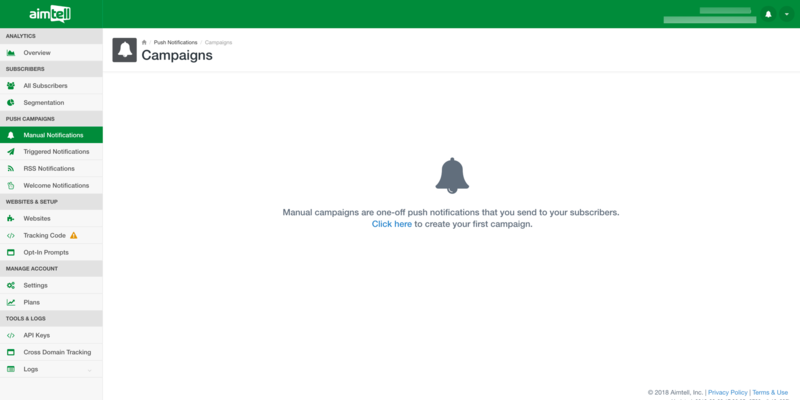 To view the results of a campaign head to "Manual Notifications" and then find your campaign in the list. Once you have found the desired campaign click "View Results". The results page allows you to breakdown the notification based on date and an optional segment. Segments are also great way to help measure conversions.